When she first moved to Woodbury in 2000, Angela Verrastro looked for the same kind of cozy, neighborhood Italian restaurants that she frequented back in New York. There were a few that came close, but none that truly captured the vibe she was missing. Over a decade later, she’s created her own—her popular Italian-American eatery Angelina’s Kitchen, which has now been serving Woodbury for more than six years. We went into the kitchen with Verrastro to learn more about what makes the restaurant run so smoothly. Like a recipe coming together for the first time, Angelina’s Kitchen has developed bit by bit over the years. The original business idea was for a prepared meal service. 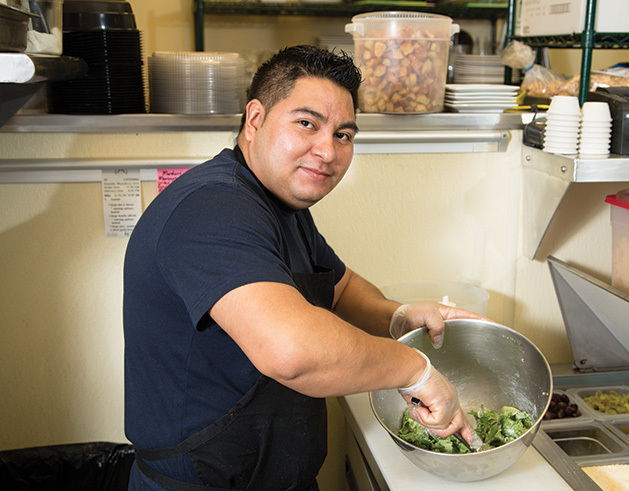 “I wanted to provide the kind of meals I would feed to my own family,” Verrastro explains. The endeavor soon became a wholesale operation. Verrastro found success selling her take-and-bake dishes in local grocery stores, but she couldn’t help feeling like it wasn’t quite what she set out to do. “It was very impersonal,” she explains. “I didn’t know my customers. I didn’t know the people eating our food. 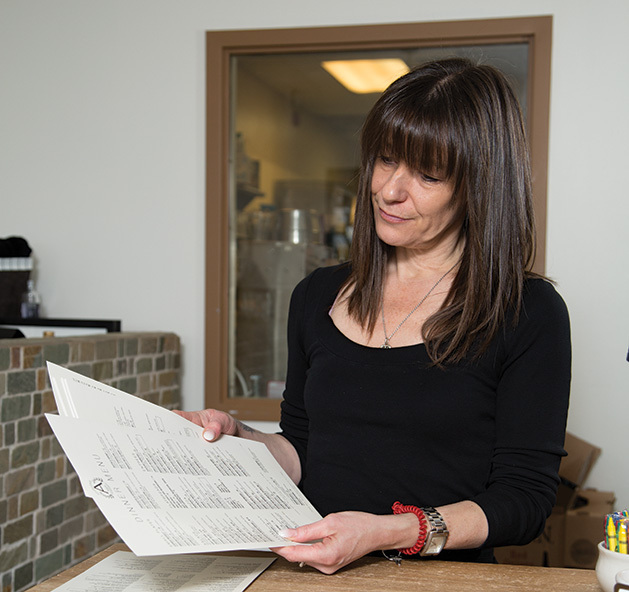 At the end of the day, it wasn’t why I started the business.” She changed gears again, and with the confidence and experience she had gained from wholesale work, she prepared for something even bigger: a full-service restaurant. It’s a sentiment that sticks with Verrastro now, as she hopes to recreate that feeling in Woodbury. “When people leave, I want them to feel like they’ve left a friend’s home and been taken care of really well,” she says. It’s not hard to imagine people leaving happy. 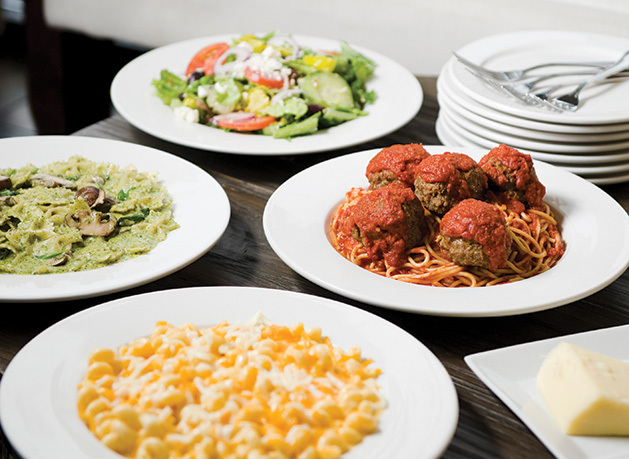 A glance at the menu will reveal classic Italian favorites like eggplant parmesan, lasagna and bruschetta. The eggplant parmesan is a best-seller, along with the chicken soup, served with orzo pasta. “The chicken soup is super simple, and so good,” says Verrastro. (I don’t have to take her word for it, as I hear a woman ordering four quarts of it to go on my way out.) “We start by making stock with vegetables and chicken, and add carrots, celery, onions. Lots of veggies.” The soup originally featured escarole, but that was taken out so that pickier kids can chow down happily (click here for the recipe so you—and your kiddos—can make it at home). In addition to the chicken soup, many of the recipes at Angelina’s Kitchen are from Verrastro’s family, and almost everything is made from scratch. “It’s something I wouldn’t do any other way. I have to be proud of what we serve,” she says. The kitchen makes fresh pasta, sauces, salad dressings, marinades, soups and stocks the old-fashioned way, with no shortcuts. There’s also a collection of desserts, most of which are homemade. The kitchen staff at Angelina’s Kitchen would agree with that statement, as they all seem to genuinely enjoy what they do. Head cook Joe Navarrette, who’s been on staff for 10 years, describes his coworkers as more like a family. He says one of his favorite dishes on the menu is called Sarah’s Favorite. Verrastro laughs when she hears that. The meal is named for her daughter Sarah, and is an amped up version of mac and cheese with bacon, spinach and chicken. “She used to get it when she was 13,” Verrastro says. “Now she’s 24 and wants her name taken off it.” The staff in the kitchen share a quick laugh before getting back to the day’s prep work. There are ten members of the kitchen staff, and they rotate duties to get everything done. Though Verrastro has taken a step back from most of the cooking responsibilities to handle more of the business needs of the restaurant, she makes sure to stay connected with her staff. “We have to do this as a team,” she explains. “I respect everyone, and I wouldn’t ask anyone to do a job I wouldn’t do myself.” The front-of-house team also work together to make sure they’re providing customers with the best experience. Hilde Murphy helps customers with takeout and catering at Angelina’s. Before she was an employee, she was a customer. “Before I worked here, I think I came every two days,” she tells me. “I’m from Belgium, and Angela had lived there, so we started chatting.” Murphy’s favorite dishes are the braised beef and spaghetti bolognese. “I eat it almost each time I work here,” she adds with a smile. With her restaurant in full swing, Verrastro feels more connected now to the people eating her food. “Talking to the customers is a job I love,” she says. While the restaurant to-dos keep her busy, she can always find a minute to chat with her patrons. Longtime server Kim Firkus also enjoys the community atmosphere at Angelina’s. “I have another full-time job, but I like working here. It’s like I’m entertaining people in my own home,” Firkus says. As we chat about what her job entails, Verrastro chimes in, adding, “She takes care of people.” It seems like that’s what Angelina’s Kitchen is all about.